At high school, Stephen Hackett applied to become part of the school newspaper, and despite having no real skills to offer, he somehow got the job. Together, the staff at the newspaper went on to win national awards. It was there that he was introduced to Macintosh computers for the first time, as well as writing, page design, and photography, which all remain as his interests today and influenced what he did once he left school. It’s all thanks to that one teacher who said yes to him. Having spent over four years working for the newspaper, he went on to study for a degree in Journalism, work a graphic design job for a non-profit, as an Apple store Genius, and in a consulting firm. It all came from his passion for technology and expressing ideas with it. And that led to him creating his own blog, 512 Pixels, about Apple products in 2008. Creating himself a loyal audience, he went into podcasting and is now the host of multiple podcast shows, as well as co-founder of the podcasting network Relay FM. 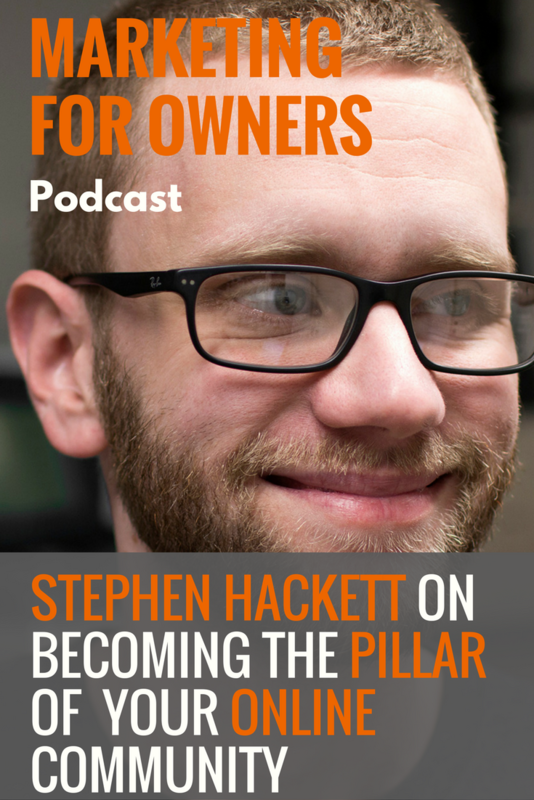 Stephen reveals the hard work that went into growing an audience for his website, how he got into podcasting, and the benefits of a podcast network. When he left his role as a lead Genius in his local Apple store to work for a consulting firm, he began to write for his own website as he had a lot of opinions about technology which he wanted to share. And whilst an Apple employee, he couldn’t. In 2017, 512 Pixels will be 9 years old. Stephen tries to balance it between writing about Apple history and looking at current technologies through that historical lens, as well as talking about the latest news. In the beginning, he used to push it primarily as a news site, publishing all of the time to be on top of breaking news. But he realized that wasn’t going to work because there were already a lot of sites out there doing that, and they had many more writers and resources. Trying to push it as a news site left him burned out as he tried to get ahead in an area he had no interesting in running in. And although it was a beneficial experience in his overall journey, at the time it left him feeling like he no longer wanted to write, and was instead doing it because he had to. So in 2011, he began to think more about what his unique voice was, and that changed the focus of the website to what it is now. As a result, the website now has a lot more traffic than it ever did before, with an audience who have been reading his work for years. And he also has relationships with many of those people. His website acts as proof that you really can hone in on a niche within a niche, and find a really passionate audience, rather than having your sights set wide. The internet is full of people interested in the same weird stuff you are. These are communities which are free from the restrictions of geography. And because there are so many people on the internet, niche content can really do well as you carve out your own little spot and own the conversation in that area. And because he did it naturally, the decisions he made were all based on it being a hobby. Even now, it is still operated as a hobby which means he has the freedom to try something different or take a break. It gives him flexibility, and it keeps it enjoyable. Since establishing the site, Stephen has been fortunate enough to do some freelance writing and getting to know people through it. He also took his writing and moved it into podcasting. He started in 2010 when Myke Hurley invited him onto his podcast about technology. Myke had come across him thanks to his website, and they ended up hitting it off. Taking on projects together, they are now the co-founders of Relay FM where they get to produce podcasts together for a living. They first started off by making podcasts for Myke’s website, but then had the opportunity to take the show and join 5by5, a guest network in Texas, which also had a focus on technology, and stayed there for 18 months. Over time, they began to realize that they’d liked being independent. Individually, they had started to think about what it would look like if they took their show and did their thing with it. In 2014, they went to Apple’s developer conference and started to flesh out what it would look like if they owned their own podcasting network to host their own shows, whilst allowing others to bring their own podcasts as well. They could own the technology, control the business, and sell the advertising themselves. By August 2014, they were launching and started with three shows. It was the hardest thing they’d done, and there were a lot of things they had to learn along the way, including how to have a transatlantic business, with Myke living in the UK. Thankfully, they already had an audience – both separately and together – which may have been small, but they were also loyal. But their time at 5by5 gave them big audience growth. Those people luckily signed up for the new shows as well and had a relaunch which was bigger than they had expected. A few weeks later, they’d been able to add a new host to the network. Jason Snell had wanted to start a new tech podcast, and it was a huge deal for Stephen to have him on board, as he’d been his idol as someone who was making a living by writing about technology. And with him also came another jump in audience numbers. The idea of bundling media together in order to sell advertising is an old idea and is something you can recognize from TV and radio networks. It means that companies can advertise against a whole chunk of content. But with a range of podcasts and hosts, it means they can also choose the content which is the best fit for their products. The sponsorship which the individual hosts receive helps them to make money from their hobby. For the hosts of podcasts, it also makes it easier for them to start out in podcasting and be successful at it. They can benefit from the other people around them who are doing it, as well as not having to handle all of the technical sides themselves. Plus, at Relay FM, there is also a community in which all of the hosts can communicate with each other. Even with the big names in podcasting, and the large audience shares they have, it is still worth getting into podcasting, as there is a lot of potential growth to be had. Although podcasting is very popular, there are still huge groups of people who currently don’t listen to podcasts. And you could be the one who makes them decide to start listening. There are also lots of free tools available to you with which you can start a podcast with minimum overheads. And if you’re already in a community, then a podcast may just help you to become a pillar of it. There are few metrics available in podcasting which really matter, and that’s partly because the same breadth of metrics which you have for your website, don’t exist in podcasting land. But when you’re talking to sponsors, the only number that is really important is how many downloads you get per episode. To get the most accurate view, Stephen uses as the average from the past 30 days, as it gives a proper sense of how the podcasts are doing. It’s also useful to see the countries in which the podcasts are being downloaded in so you have a sense of not only who your audience are, but also the advertising territories which are available to you. On Relay FM, there are now around 30 podcast shows, so there is plenty there for you to start checking out today. And make sure you give the shows which Stephen hosts a listen. If you want to get your geek on, then 512 Pixels is where you can find all of Stephen’s writing about a wide range of Apple products, past and present.